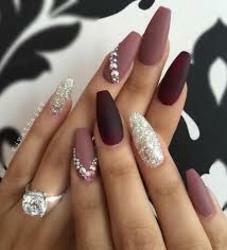 Background is an essential factor when it comes to designing the nails with Colours of Ladyhood !! Wonder how bountiful it is when you sense the contrast of white specks on a Black Background or else the extensions of Deep Azure on the light background of Turmeric or Crimson. These shades are not the real essence of your personality but the canid image of your virtual identity, which are no less than a Mirage not only in your Reality but in your Dreams probably.